My research as a military historian examines one of the most extreme forms of human activity; war. Great interest has duly been shown to understand the causes, the events during conflict and the costs of wars. This has included looking at individual countries down to individual people. While more enlightened attempts to better understand war are fuelled by the desire to contribute towards preventing future conflict, many others are driven by the fascination to see what activities people and countries were willing, coerced or forced to undertake as a consequence of war. At the forefront of all my research as a military historian is therefore a sombre recognition of the human cost of conflict to both civilians and combatants. This carries through to my sensitive approach with clients, which respectfully acknowledges that the research usually relates to considerable losses of life. Research as a military historian requires me to pursue quite different enquiries because of the wide range of associated war topics. This includes following the lives of individual service personnel from their military records, exploring a specific moment in the conflict in great detail or looking at a theme that spans the entire course of a conflict. If you would like me to research the history of a member of the armed services from their service record, are interested in me gathering more research material for you on a specific topic or have a broader research agenda then please contact me when you are ready here. As with all my services, they are available to individuals or organisations. Please be assured that I offer an equally considerate service for each client. If you are an organisation that has a project which needs to appoint a military historian then please get in touch with your details here. I am happy to work and communicate with other members of the project team. This includes attending meetings to report on progress and speak publicly at event for an organisation. It is useful to have an idea of the type of services that I have provided. My most recent client, Mr G. Wilkinson, has kindly provided me with one to share with you. A second testimonial from Gaenor Deacon follows. Testimonial regarding services of Dr. Hywel Gordon Maslen Archival Researcher. Having obtained my late father’s Second World War service record 1940 – 1946 which confirmed he had served in North Africa, the Middle East and been awarded 5 medals with the Royal Electrical and Mechanical Engineers (REME) operating as a driver, I wanted to find out much more detail regarding which campaigns his unit was involved with, where these had taken place etc. After contacting ‘National Archives’ I was just referred to various web sites which proved to be very complex and time consuming with no guarantee of finding the detail I was looking for. I therefore decided to appoint an independent researcher and from the National Archive list selected Dr. Maslen. Over a period of 4 months communications were excellent and I was presented with regular updates/stage reports detailing progress. The information was first class providing me with just the sort of detail I was looking for e.g. campaigns actually served in North Africa, Libya, Sicily and Italy. I had now been presented with over 1,000 pages including photographs detailing my father’s service record with the REME. Whilst I could have gone through all this information and extracted the key data, I took up the option of requesting Dr. Maslen to do this and produce a summary report from which I received an excellent concise 9 page report. As a result of and thanks to Dr. Maslen’s expertise, experience and excellent work including researching REME history, War Office and Cabinet files, Public and service records etc., I now have a detailed report and understanding of my father’s WW11 service record which will be kept and handed down through future generations of my family. Several years ago I obtained my father’s war record. Like many other people my knowledge of what my father did in the war was sketchy at best. 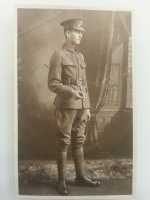 From one photograph I ascertained that my father was in the Royal Welsh Fusiliers, however the war record showed that he initially enlisted in the RAOC. After a couple of years trying to make sense of the war record on my own I realised that I needed the help of a professional. I made contact with Dr Maslen and over the past eighteen months He has traced my father through different theatres of war and countries. Dr Maslen’s work has been conscientious and thorough. Because I expressed an interest in finding out more about my father’s experiences he includes book and website references so I can find out more information for myself. His research also includes material which gives insight into the places my father was stationed. It gives me a sense of the places; the dangers but also the atmosphere of life in war conditions. Dr Maslen is willing to answer any question, no matter how ridiculous it seems. I am pleased to recommend him to others seeking the assistance of an Archival Researcher.